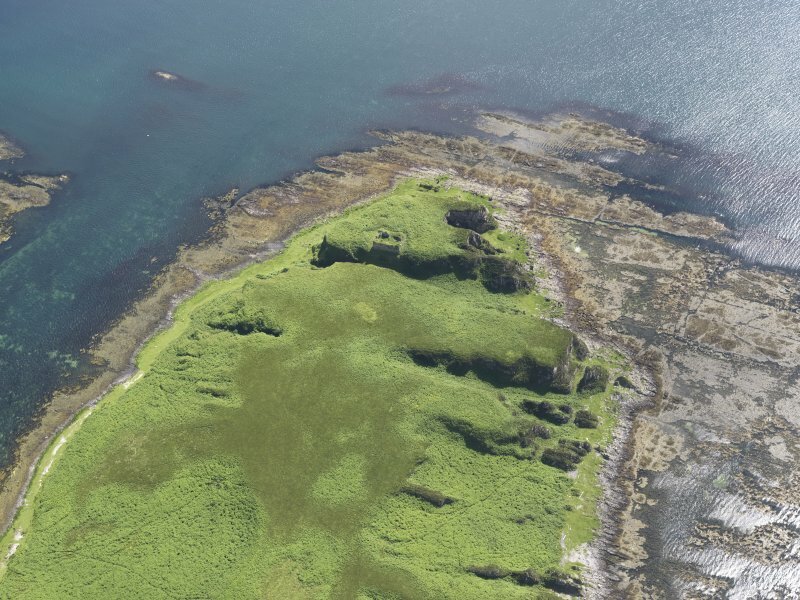 Oblique aerial view of Am Fraoch Eilean and Claig Castle, looking N.
Oblique aerial view of Am Fraoch Eilean and Claig Castle, looking SSE. Oblique aerial view of Am Fraoch Eilean and Claig Castle, looking SW.
Oblique aerial view of Am Fraoch Eilean and Claig Castle, looking NNE. 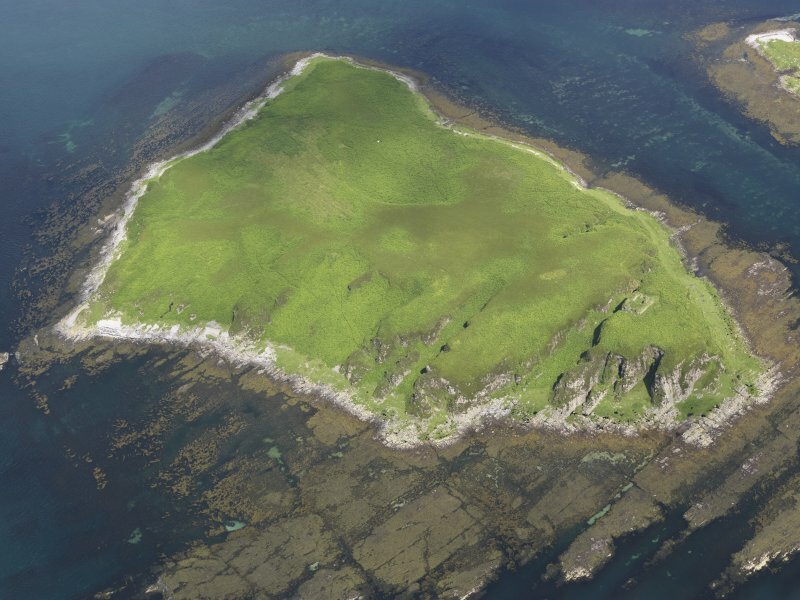 Oblique aerial view of Am Fraoch Eilean and Claig Castle, looking SE. 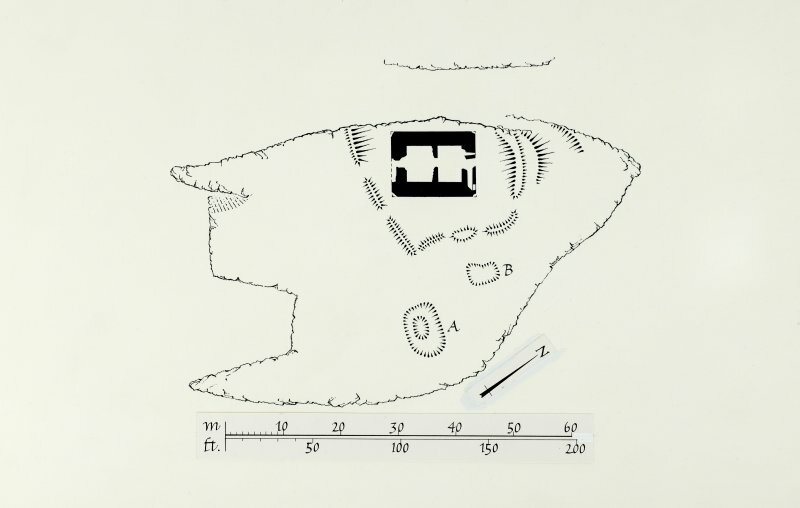 Oblique aerial view of Am Fraoch Eilean and Claig Castle, looking W.
Publication drawing; Claig Castle site plan. Jura, Claig Castle & Jura House. General view from South-East. Publication drawing; Claig Castle ground floor. Jura, Claig Castle. 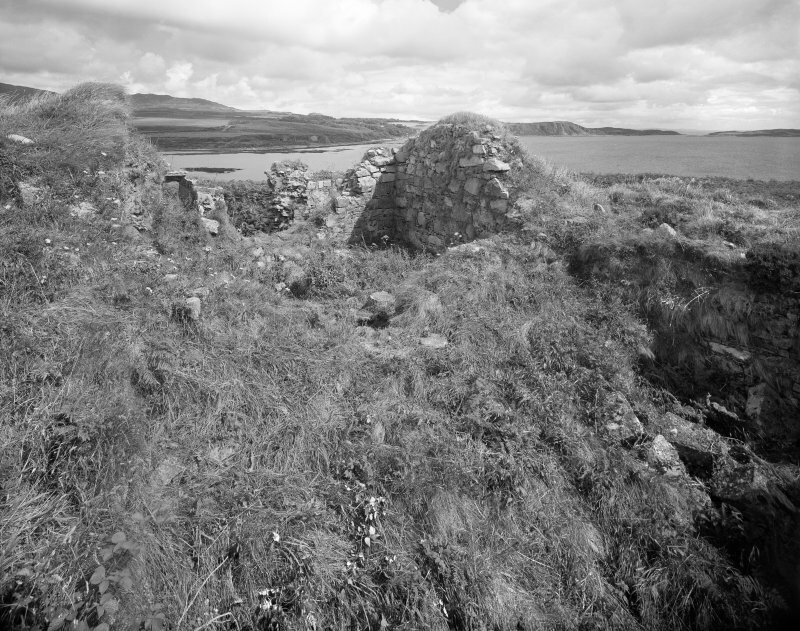 General view from South-West showing ruined walls of interior. Claig Castle: This West-Highland type hall-house measures 15.2m by 12.0m over walls 2.5m to 2.8m thick and survives to first floor level. A cross-wall dividing the ground floor, and a mural stair are features of the original structure (Jarvis 1974). Pennant (1774) noting this building as ruinous, states that its W side is defended by a deep, rock-cut ditch. It belonged to the Macdonalds. T Pennent 1774; M C Jarvis 1974. Budge regards the ditch noted above as a natural feature. He names the castle "Clag Castle". The summit area of Am Fraoch Eilean, lying some 20m above sea-level, is divided into two unequal portions by a narrow gully which traverses the full width of the island from N to S. The castle occupies the smaller, or E, portion of the summit, the main building rising directly from the lip of the gully. 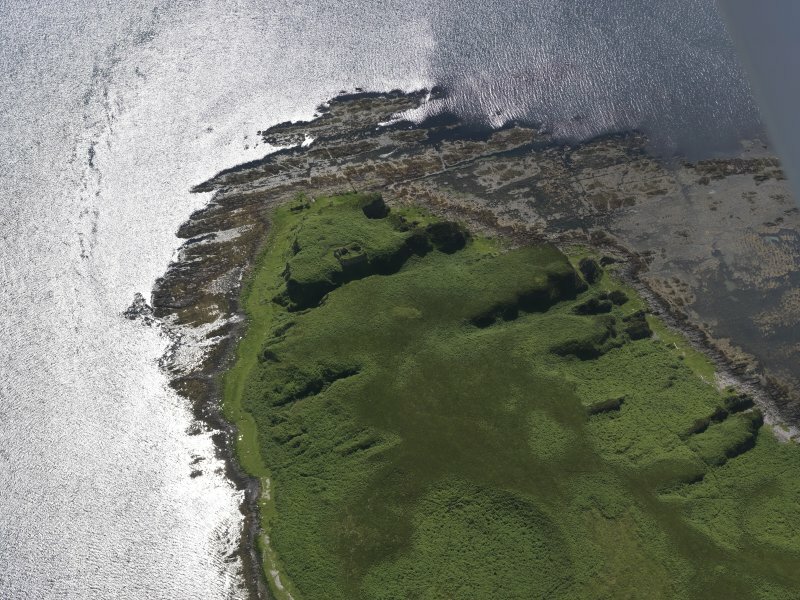 The remainder of the summit is ringed by cliffs and access was probably obtained from the gully by means of a roughly formed approach path. The only standing building is a small tower-house, which measures 14.3m from N to S by 11.0m transversely over walls some 2.4m in thickness. Only the ground floor now remains, but it is probable that the structure originally comprised two main storeys, together perhaps with a garret contained within the roof. The masonry is solidly constructed of local rubble blocks, roughly coursed and well bonded with pinnings laid in coarse lime mortar; the walls rise from a high base-plinth. It is evident that the structure originally incorporated dressed quoins and margins of freestone, but nearly all of these have now disappeared. 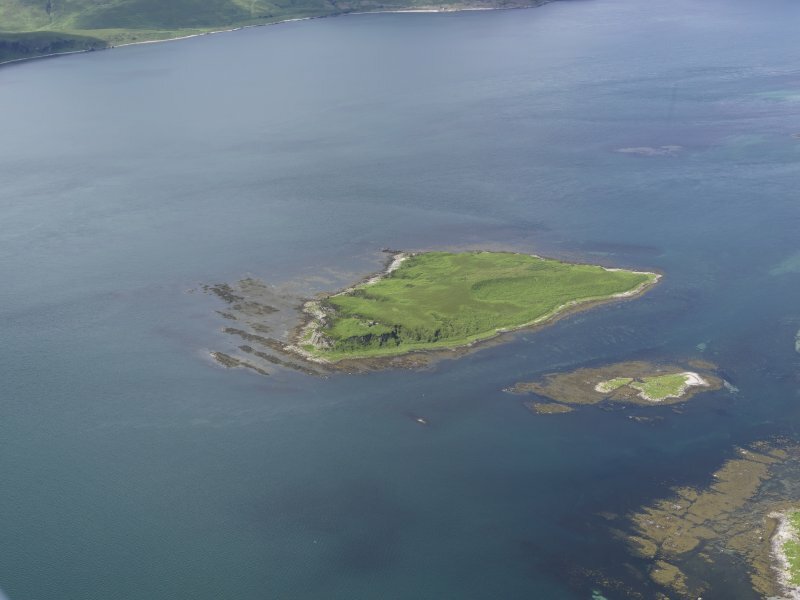 Surviving fragments indicate, however, that the stone in question was a fine-grained sandstone varying in colour from white to red and probably emanating from the island of Arran. 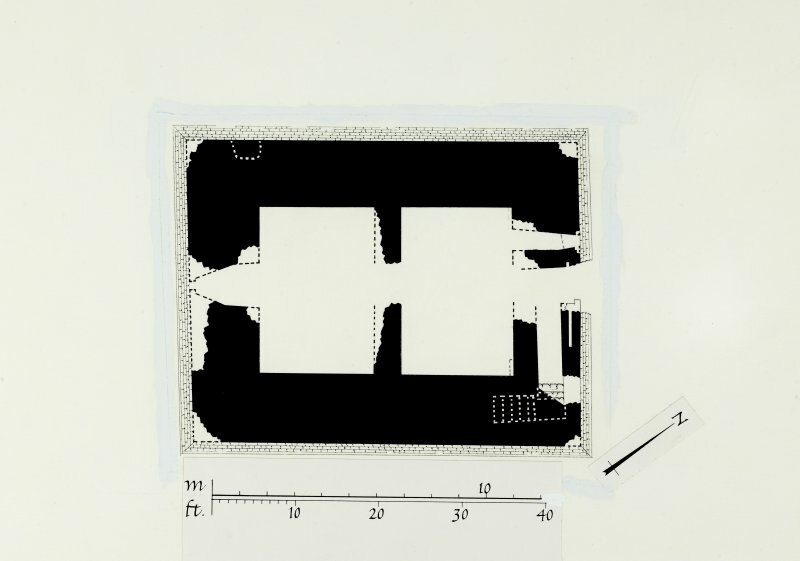 The entrance-doorway, which was centrally placed in the N wall at eround-floor level, was orovided with a draw-bar. This door gave access to a small lobby from which a second doorway evidently communicated with the outermost ground-floor room, while a third opening on the E led into a staircase. The ground floor comprised two chambers of equal size separated by a substantial partition-wall containing a centrally placed doorway. Both rooms probably served as cellars and each was lit by a single deeply-splayed window in the end-wall. The chambers appear to have had joisted ceilings supported on timber runners and some traces can still be seen of the stone corbels that formerly housed the N runner of the N cellar. The mural stair in the N wall ascended in a straight flight to a landing in the NE corner of the building before turning at right angles to rise to first-floor level. Immediately below the landing there are some traces of what appears to have been a small window in the N wall. Little can now be said about the arrangement of the upper levels, but the first floor is likely to have contained a single large chamber, namely a hall, lit by windows in the side-walls. There may have been a latrine at the SW corner of this room, where some remains can be seen of what seems to have been a vent-shaft discharging into the gully. The building was probably surmounted by a pitched roof rising within a continuous open parapet-walk. 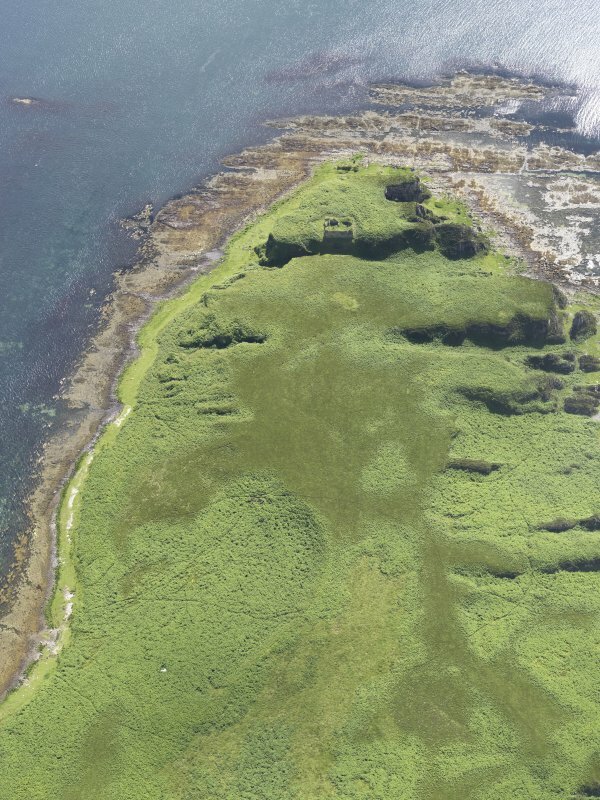 On the N, S and E sides of the tower-house there are traces of an enclosing bank and ditch, the bank probably being partly natural in origin. Much of the surrounding summit is covered with a dense growth of vegetation and, although other buildings may formerly have existed in this area, the only features observed at the date of visit were two small irregular-shaped depressions (A and B on the RCAHMS 1984 plan) which may have been utilised for catchment purposes. The design and details of this building are not closely datable, but, taken together, the architectural and the slight historical evidence (infra) suggest a late medieval, probably 15th-century date of construction. 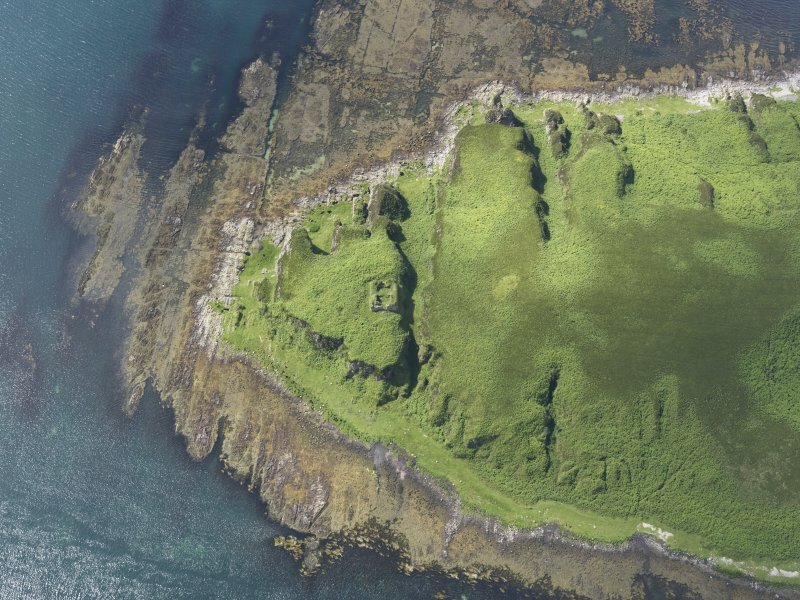 The castle is not included in John of Fordun's late 14th-century list of island strongholds and has little recorded history. 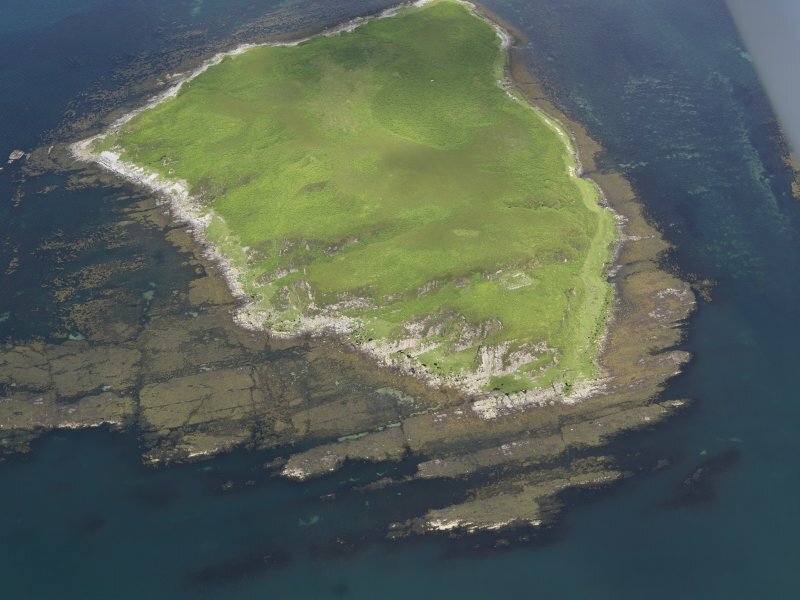 It is said to have been used on one occasion as a prison by Angus, son of John II, Lord of the Isles, and also featured briefly in Donald Dubh's unsuccessful rebellion of 1545. 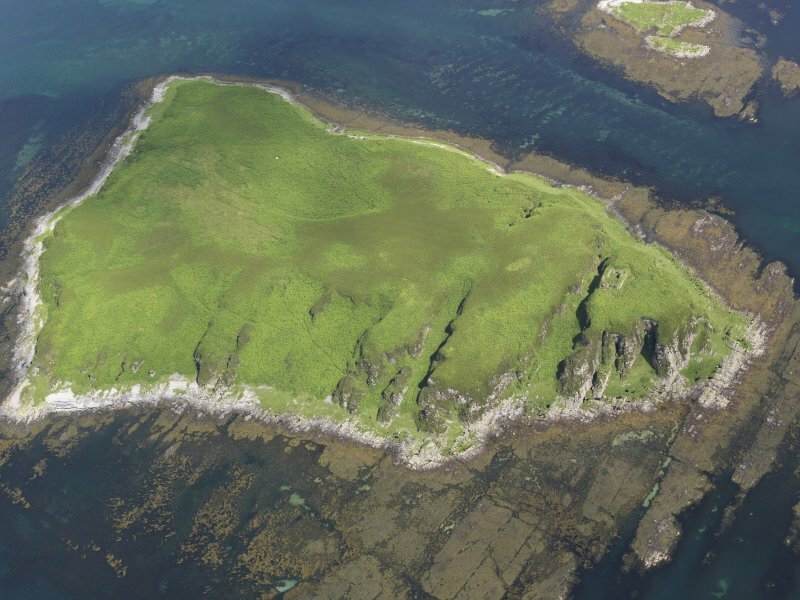 Monro, writing only a few years later, mentions the island, which he named Ellan Charne, but makes no specific reference to the castle itself, and it was left to Pennant, who visited the island in 1772, to produce the only early account of the remains. 'After dinner walk down to the Sound of Hay, and visit the little island of Fruchlan, near to the shore, and a mile or two from the eastern entrance. On the top is a ruined tower of square form, with walls nine feet thick; on the west side the rock on which it stands is cut through to a vast depth, forming a foss over which had been the drawbridge. The fortress seemed as if intended to guard the mouth of the sound, and was also the prison where the Mac-donalds kept their captives, and in old times was called the Castle of Claig (Monro; Anderson 1842; Pennant 1772). 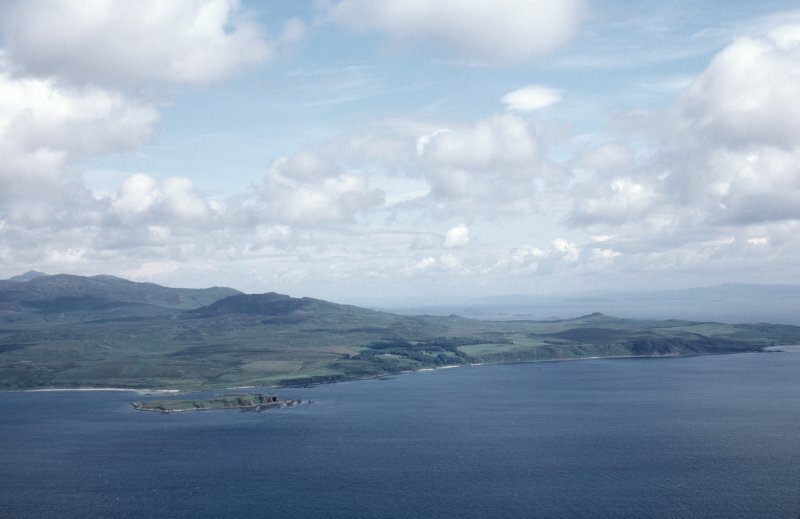 RCAHMS 1984, visited July 1974. 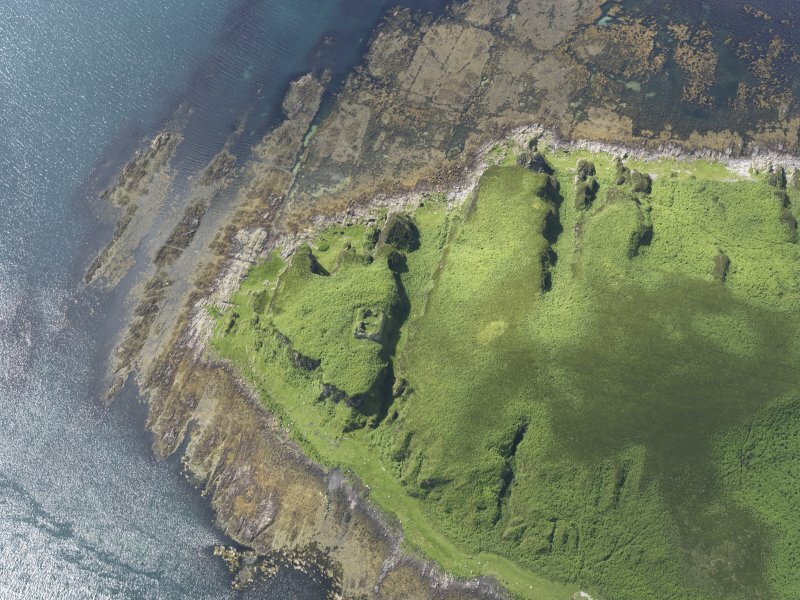 Claig Castle (name verified), as described by Jarvis, is situated on a cliff-girt plateau at the south-east end of Am Fraoch Eilean, separated from the main body of the island by a steep, natural gully. Visited by OS (N K B) 22 May 1978. The slight historical evidence and features suggest a late medieval, probably 15th century date. Only a ruinous ground floor remains but it is likely that it comprised two main storeys, together with perhaps a garret contained within the roof.